Now, let's think about what the phrase "special effort" means. Thesaurus.com suggests "fall over backwards", "go out of the way", or "take special pains." I might also suggest "do extra work", or "more than ordinary effort." It goes back to the definition of what is normal or expected of a system. Changes in Health IT Policy over the course of ten years which incentivized the development of of these capabilities in systems. Changes in Payment Policy made use of these capabilities the norm for providers who wanted to get as much money as they could from CMS. The development of standards (the second part of the definition) which enabled these capabilities. Making a policy change isn't simple. It's a process that takes years to complete, and a ton of people and effort. CMS doesn't just get to decide to make a change, tell everyone, and then everyone complies. There's a multi-year long process to making a rule, and that operates under the presumption that there's already legislation in place to make the rule. If not, there's another several month long (at least) cycle just to get the legislation in place. And rules have to leave time for people to implement them. So, from legislation to implementation is at least a 3 year long process, and that's when the pressure is on (i.e., the early years of the HITECH Act). Once implemented, we now begin a new stage of learning ... what works, what doesn't work, and what needs to change. And then the process starts over again (and if well designed, it already had moved into the next stage). Developing standards is equally complex. The best work takes decades. But e-mail ... took 60 years to get where it is today. But the internet (HTTP, HTML and the web) ... took 20 years to get where it is today. But XML ... took 3 years from inception of the project to become a standard, and it started from a standard (SGML) that had been in existence for 20+ years before it, and is still being advanced today some 20 years later. But JSON ... is based on work started in 2006 and took another 7 years to be defined as a standard ... and is still being refined today. CDA is almost old enough to drink as a standard, and was in the womb for three years before it's first publication. The inception of FHIR can be dated back almost a decade, the first published proposal (and there was a lot of work before that was published) goes back eight years. Whether it's technology or policy, by the time you get there, the goal posts will have changed. That's called progress. I am sorry, but sharing information is a requirement for continuity of care and integrated systems. We in Brazil already had referrals docs on paper before there were EMRs. So it was a need, that vendors never fulfilled. In the late 90s in Brazil, information was already being exchanged via FTP and standardized information models and terminologies already existed. In Brazil, the first publication of the country's national health policy, published at the beginning of the 21st century, already spoke of the need for systems to interoperate and of a formalism for the representation of health data, to guide vendors and try to avoid to create silos of information. 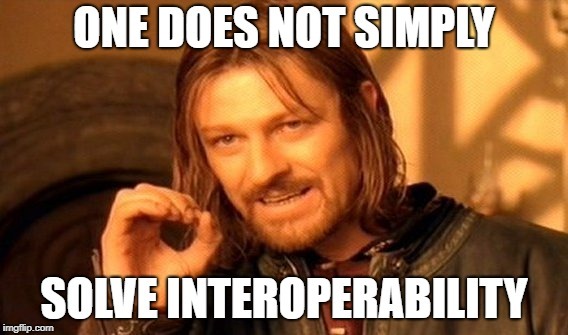 Even in the United States, the EHR association of HIMSS already published in 2006 a road map for interoperability, where the need to standardize data for data reuse was one hard requirement.The HL7 EHR functional model R1 was published in 2007 with these requirements . Still older is the GEHR, which was published in 2002.